We’ve had the Ibex Corrida for a while now. I figured this would be a good time to provide an update on how the bike is doing. You may remember that I rode it in the City of Angels ride. The course we rode was about 40 plus miles which included the jacked up streets of Downtown Los Angeles and the hills of Hollywood. The Corrida’s drive train is simply smooth. 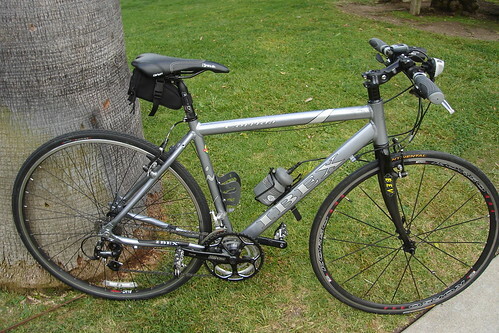 I loved the combination of the Shimano 105 rear derailleur, R443 front derailleur and KMC Z9200 chain. These components make the Corrida feel like it is worth more than the online direct price of $599. In fact when you’re riding this bike you could easily say that it feels just as good or even better than some of the big name bike company’s flat bar road bikes that cost twice as much. 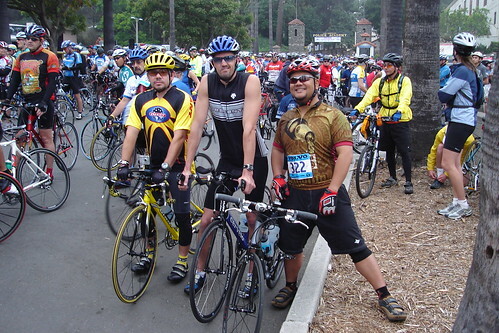 During the City of Angels ride, I didn’t have any issues with the Corrida. Everything worked like a charm. No skipping of the chain, no braking issues, no creaking….absolutely NO problems what so ever. In fact, I enjoyed the Corrida so much, I decided to use it for the Ride of Silence a few days ago. During the event, the Corrida got quite a bit of attention from the other riders. They were impressed that the bike had the components that it did and it does look pretty sharp. The Corrida is a fast bike, great value and the folks at Ibex Bicycles are pretty cool too. If you ever have any issues, questions or comments, Jack and his staff will be able to help you out. The folks at Ibex are true professionals, they know their bikes and they know what works best for their bikes. Its no wonder the bikes we test for Ibex have always been top notch. That’s a sweet looking bike you got there! This is my next bike for sure!